Clear and dry weather persisted last week. The normal Minimum ans well as normal Maximum Temperature has also gone down during the week. 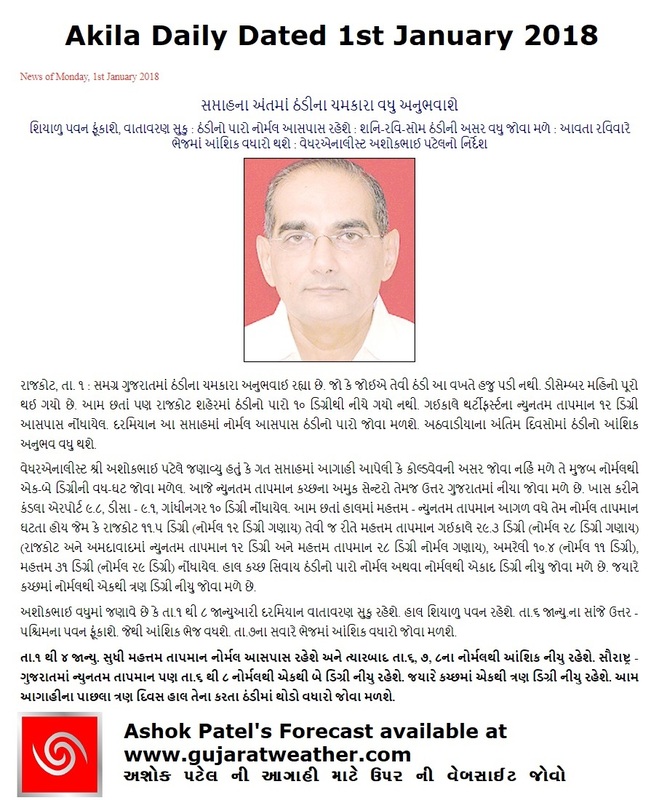 Rajkot and Ahmedabad is normal is 12 C while normal Maximum is 28 C. Normal Minimum for Deesa is 10 C while normal for Amreli is 11 C. Hence, we observe that the Minimum Temperature has been near normal to 1 to 2 C below normal while the Maximum Temperature is near normal over most parts of Saurashtra, Kutch & Gujarat. (There is some sort of anomaly between Minimum Temperature of Naliya at 4.8 C being 5 C below normal and Bhuj at 11 C being 1 C above normal !) The winds are mainly from Northeast. 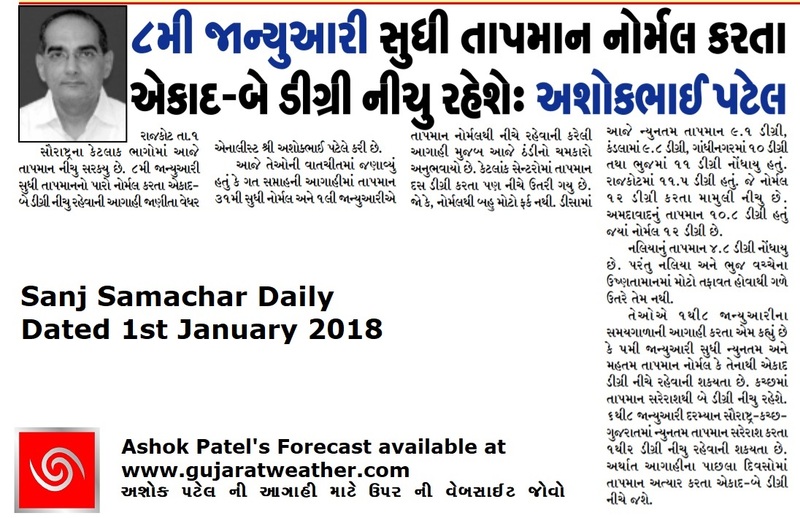 The Minimum Temperature will remain near normal to 2 C below normal till 5th January, and decline further to 1 C to 3 C below normal during 6th to 8th January 2018 over most parts of Saurashtra, Gujarat & Kutch. Maximum Temperature will be near normal till 5th and subsequently decline to 1 to 2 C below normal. Weather will be dry and clear and no fog expected. સૌરાષ્ટ્ર, ગુજરાત અને કચ્છ માં ન્યુનતમ તાપમાન નોર્મલ અથવા નોર્મલ થી 2 સી સુધી નીચું રહેશે 5 તારીખ સુધી અને ત્યાર બાદ નોર્મલ થી 1 થી 3 સી સુધી નીચું રહેશે. મહત્ત્તમ તાપમાન 5 તારીખ સુધી નોર્મલ આસપાસ રહેશે અને ત્યાર બાદ નોર્મલ થી 1 થી 2 સી નીચું રહેશે. શિયાળુ પવન રહેશે અને ઝાકર ની શક્યતા નથી.